It's no secret I'm a big fan of natural gas - I believe it is the fuel of tomorrow - but I've been feeling a little bad lately because I've been pooping on coal so much. The coal industry in this country has a long and proud history and many of the places where it is mined, especially on the east coast, have seen more than their fair share of economic distress over the past quarter century. I worry most about West Virginia. I guess it symbolizes the coal industry to me. My worries were lessened recently when reviewing GMX Resources's recent presentation. The presentation discussed the geology of the Marcellus Shale. 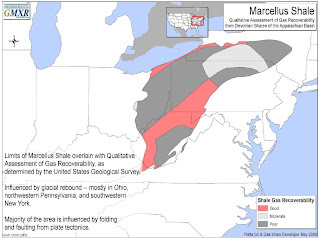 I haven't spent much time looking at the Marcellus. 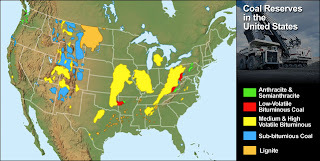 I know that it covers a gigantic region, from West Virginia into Canada, and that it is estimated to surpass the Haynesville Shale in recoverable gas in the next decade, but I never thought about where the recoverable gas is located. The map below shows that much of the Marcellus's recoverable gas is located in a band that runs through West Virginia into western Pennsylvania. It seems to sit below the largest area of east coast coal reserves (second image below). Seeing this map makes me feel better. I hope the eastern coal states can build a natural gas production industry - they are well behind other gas producing regions in terms of natural gas infrastructure - and hire people now in the coal industry. But most importantly it relieves my guilty feelings towards West Virginia. Exxon's Weapons of Gas Destruction? Plains Exploration: Hey Big Spender! Cows Killed by Bad "Stuff"
Arctic Gas to Remain Stranded Indefinitely? A Poor Choice of Words? Hydraulic Fracturing to be Regulated?